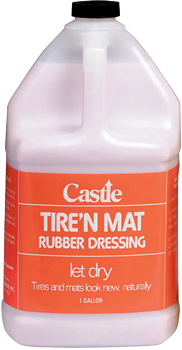 Castle® Tire’N’Mat Rubber Dressing renews bruised and discolored tires for a showroom finish. 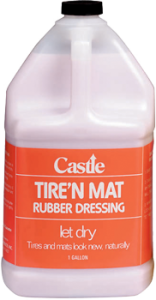 It is formulated to make old tires and rubber mats look like new, producing a high luster that protects while repelling dirt and grime. It imparts a fresh, clean fragrance when used on interior surfaces. 1. Make certain surfaces to be treated are clean and dry. 2. Apply liberally with sprayer, brush, or sponge. 3. Allow approximately 5 minutes for penetration and drying. 4. Any dressing not dry after 5 minutes can be lightly blotted. Do not store near acids. When handling this product wear gloves and eye protection. This is a high pH product. Do not use full strength product on glass.